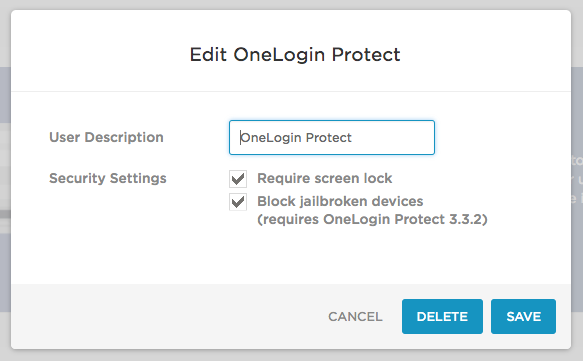 OneLogin Protect (formerly OTP) 3.3.2 provides administrators with the option to prevent users from using OneLogin Protect on a rooted device. We have also enhanced security by preventing clones of the OTP seed from one device to another. Your phone appears to be rooted. OneLogin Protect has been configured to deny support for rooted phones. Contact your administrator for help. Why are we adding this option and recommending it strongly? For second-factor authentication with OTP to provide a strong second line of defense against intrusion, the device that hosts the OTP app must itself be secure. Search for OneLogin OTP or OneLogin Protect and click Update. To enable the Passcode requirement, go to Settings > Authentication, select OneLogin Protect from your existing factors or click New Auth Factor to add it, and select Block jailbroken devices when you configure OneLogin Protect.